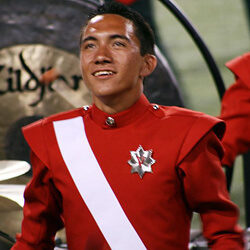 Benji Baker, 19 University of North Texas Blue Knights 2009-2011, Santa Clara Vanguard 2012 Front Ensemble 1. Go to a camp. As simple as it seems, this is the most important step to marching in a drum corps this summer. Too many people don't get to experience drum corps because of nerves or a lack of faith in their abilities. Just do it! The worst that can happen is you'll learn a lot and improve your skills. If the question in your mind is where to march, consider a few things: When I was auditioning for the first time, I asked my band directors for suggestions. Your directors might even have a connection with staff members of a corps. Also, watch a lot of drum corps performances via the DCI website or other sites online. Getting familiar with the activity will help you decide what you like and don't like as far as shows, staff, technique, reputation, and music in a corps. 2. Be a sponge at auditions. Learn as much as possible. Use that short weekend or day camp to discover the in and outs of the organization. What's the technique? Is the staff helpful? Are the veteran members the kind of people who you'd like to live in a bus with for three months? Also realize that any instructional information will generally all be a crash course. Corps want to see who can take bits of information and quickly apply it to whatever is being worked on. Over the course of the audition camp be sure to soak in the information you find useful so that regardless of whether you are offered a spot in the corps, you will still have a new bank of information to bring back to your high school or college program. 3. Meet new people. Drum corps is really just a crazy social experiment where a bunch of adults corral 150 students into tiny, confined areas and make them labor for hours underneath the summer sun for the band equivalent of synchronized swimming. But in all seriousness, it's good to meet new people! Drum corps is a place where people find who they are and come out of their shells. People in drum corps come from all walks of life. I've found it interesting to learn from fellow corps members about how culture is in different parts of the world. And who knows? Maybe your life-long friend will be the person who you eat lunch with at that first audition camp! 4. Have an open mind. You will be exposed to a lot of different pieces of information and ideas. Some of these may differ from your own, and this is normal. There's almost always at least two or more ways to accomplish a task. If you are confronted with a technique difference, try it out! Very rarely will a corps take someone who is resistant to change. As I said before, drum corps want people who can take information and quickly make a change. This also applies to earning a spot in the corps. In my first year, I originally auditioned for the battery percussion section, but was instead put in the front ensemble. Instead of being disappointed about it, I took it as a challenge. As it turned out, I really liked being in the front ensemble. The thing I think most people forget is that a spot in a drum corps is still a spot in a drum corps. It is okay to have some ego, but be sure to keep it in check and be humble with what you are given. Open your mind and take it all in. 5. Make valuable connections. Communicate with the staff. Ask questions. Become acquainted with the people in charge. Make yourself known within the audition group, not in a cocky and annoying sort of way, but as an approachable and friendly person. With the corps I march, the staff leans toward people who get along with each other and the staff. They will choose people who will get along for three months when it's hot and the air conditioning just went out on the bus. Additionally, the connections you make in drum corps could lead to future jobs or opportunities that you might otherwise not have. The audition process can be nerve-wracking to most people. Just know that everyone else who's auditioning for the first time is just as scared as you are. Whatever you do and wherever you go, just play or spin your best and see what comes to you. Generally, things will work out for the best in the end! Good luck! View additional audition tips, and learn more about corps audition dates, locations, and more.